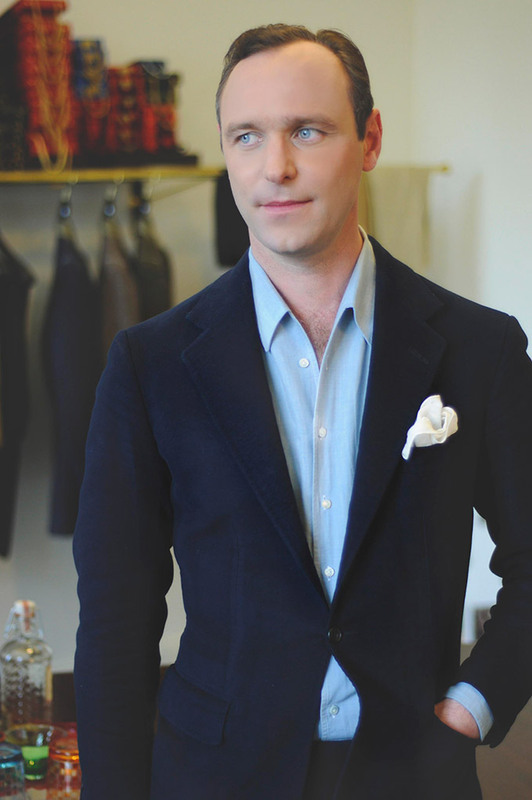 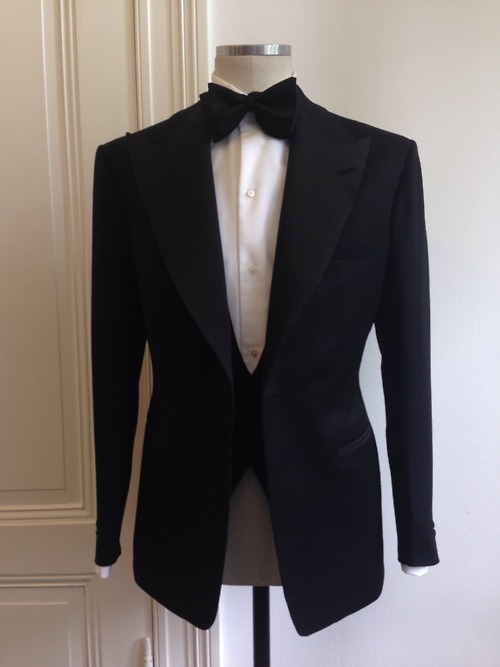 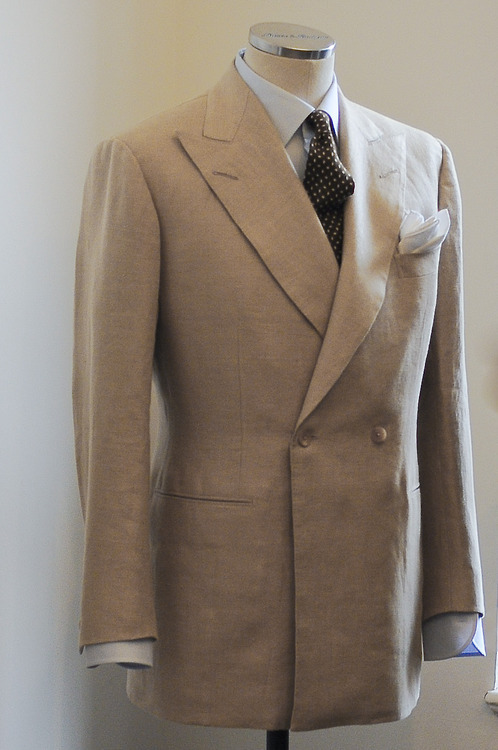 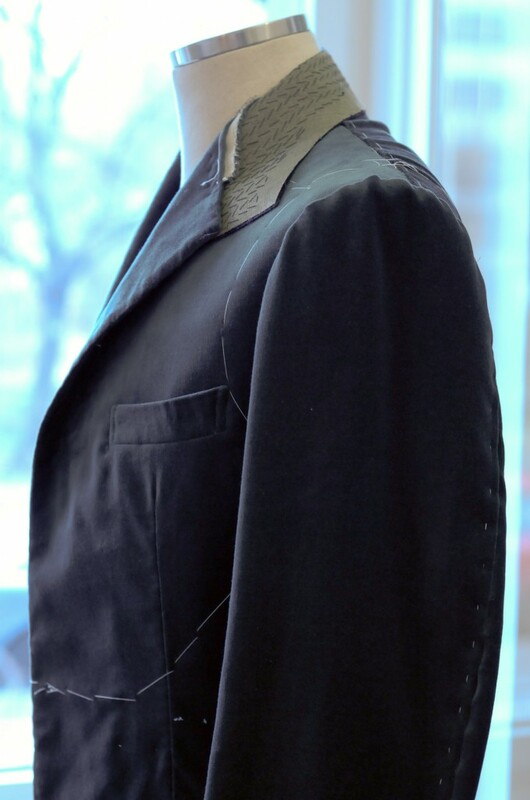 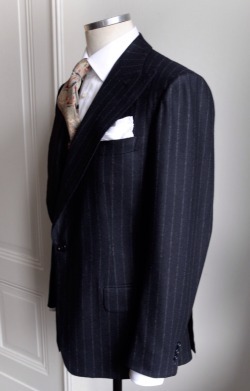 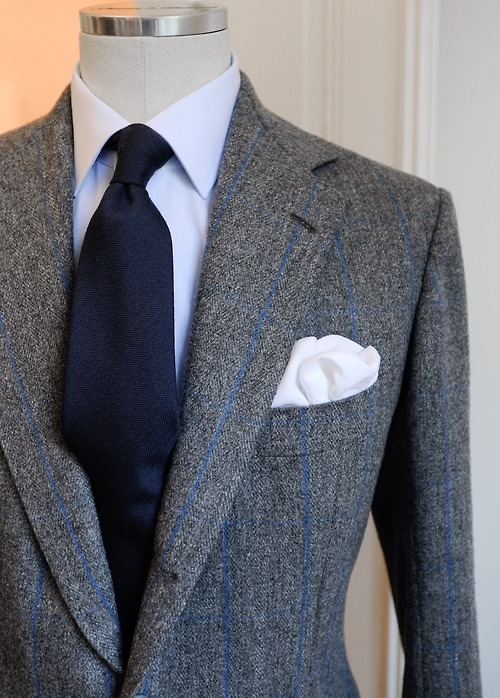 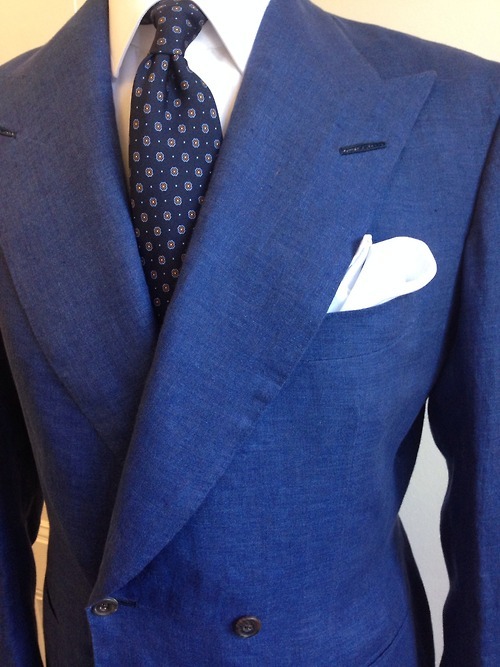 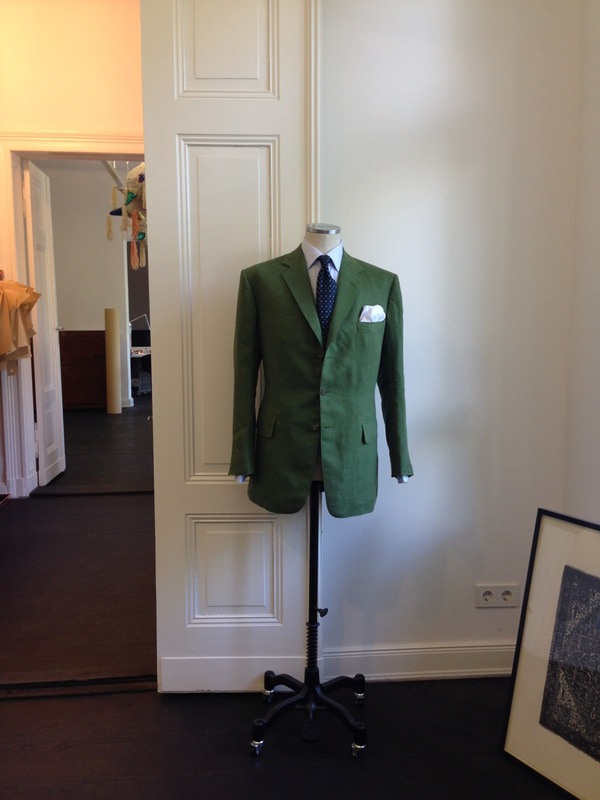 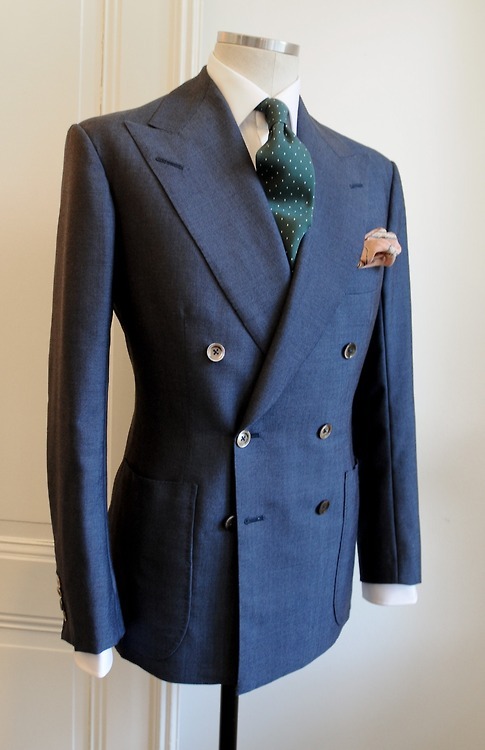 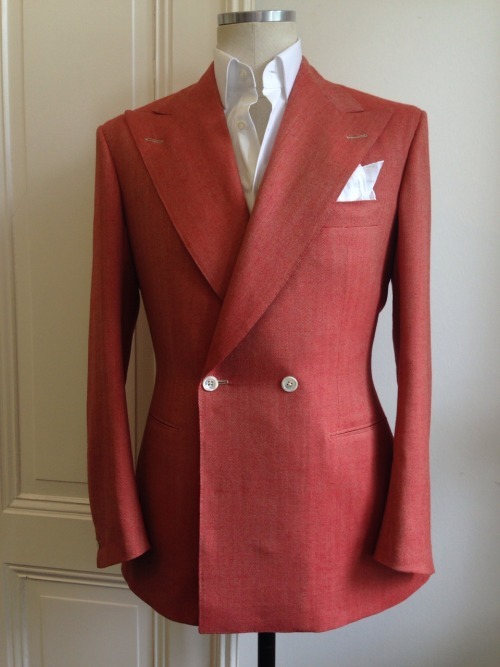 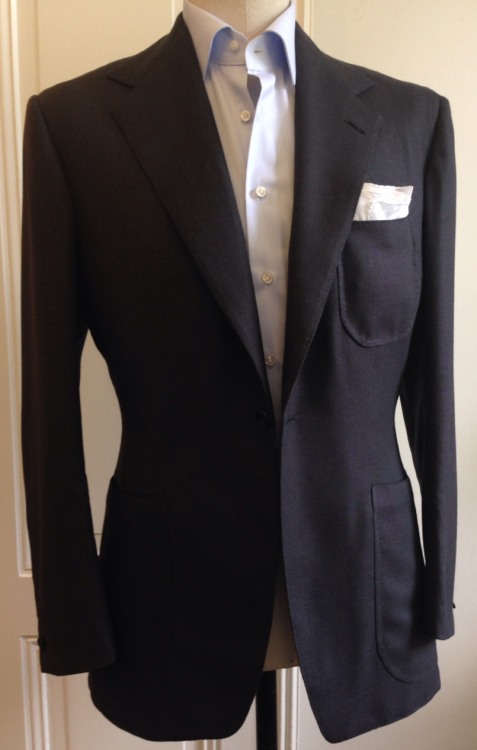 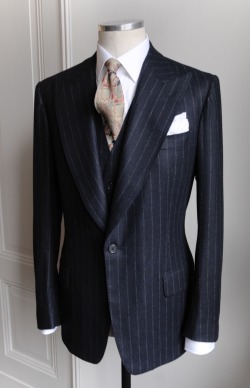 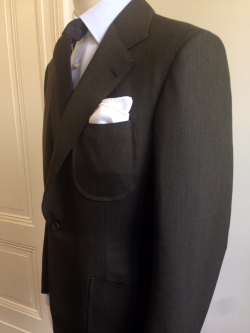 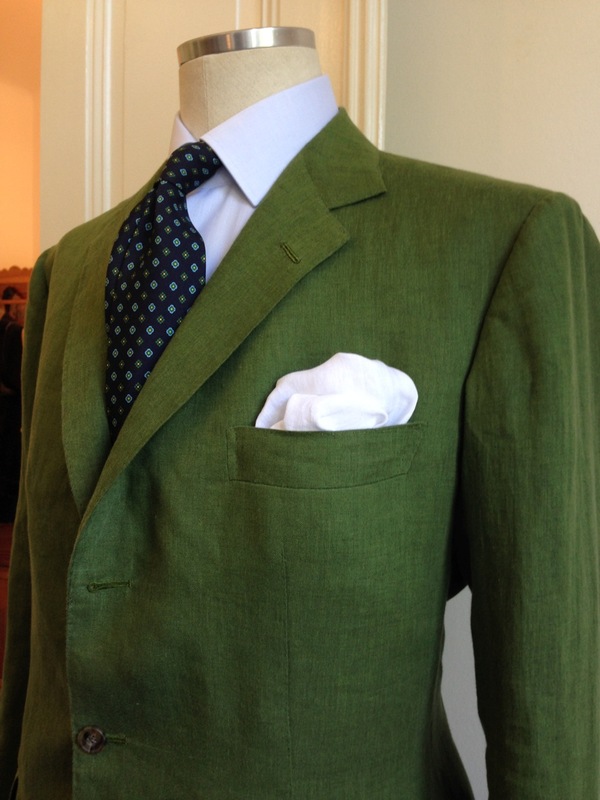 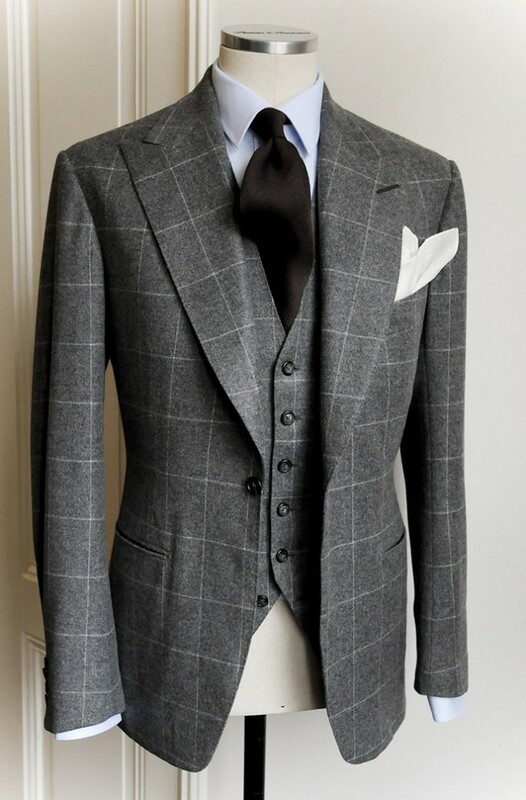 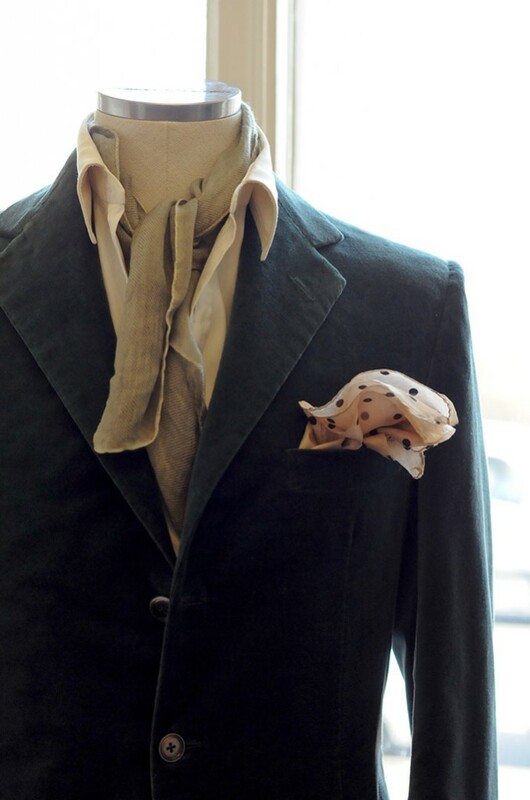 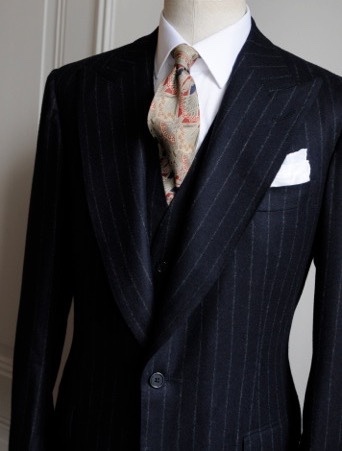 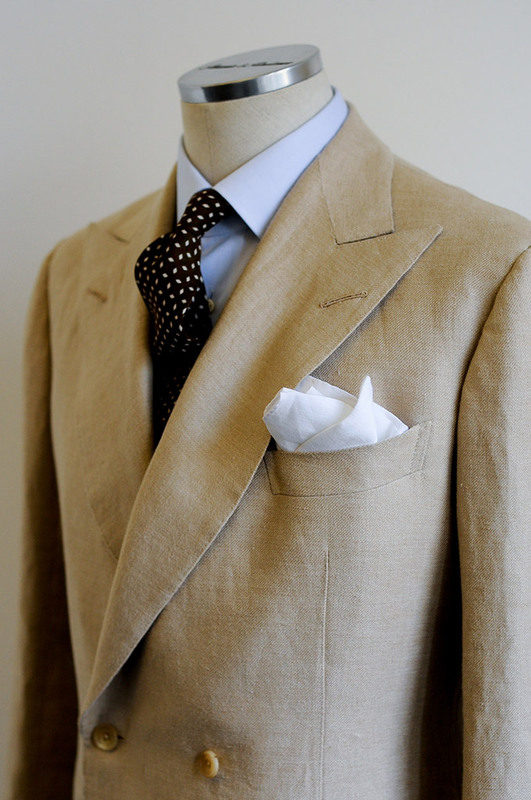 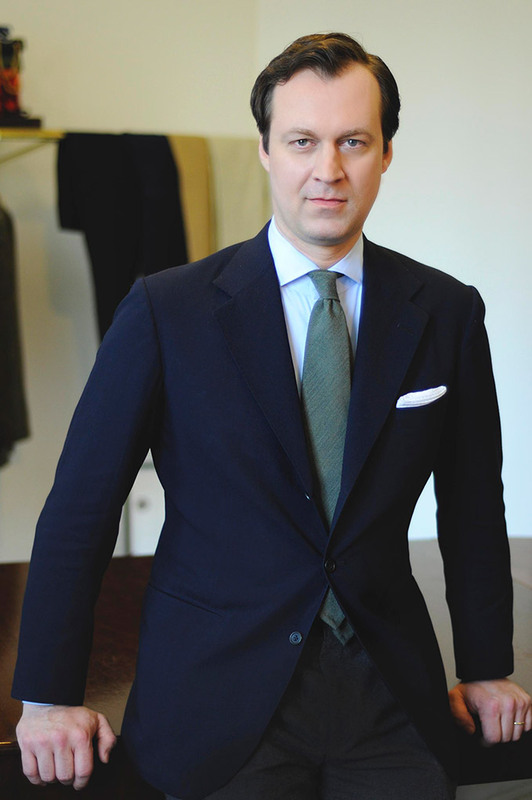 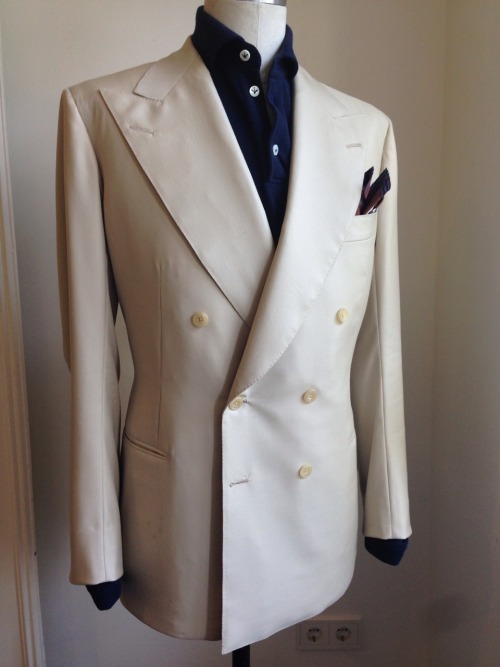 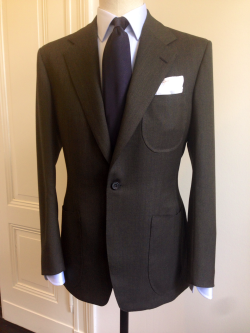 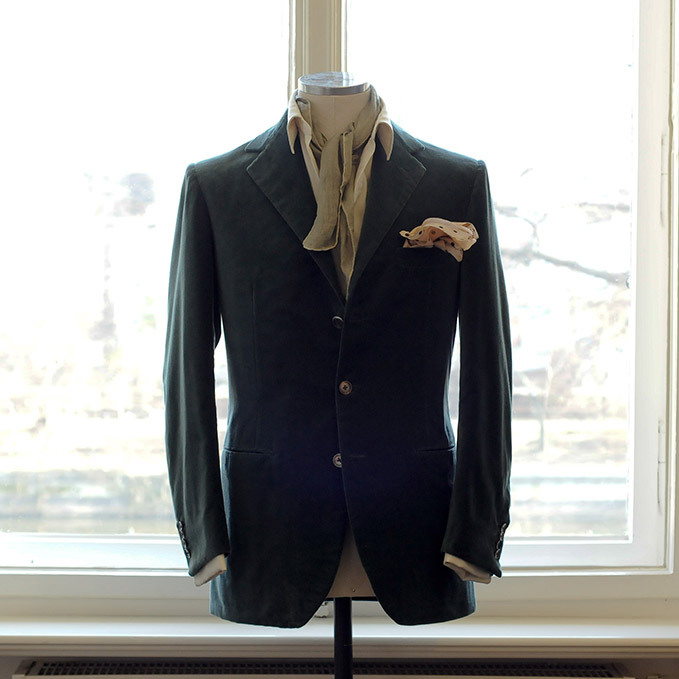 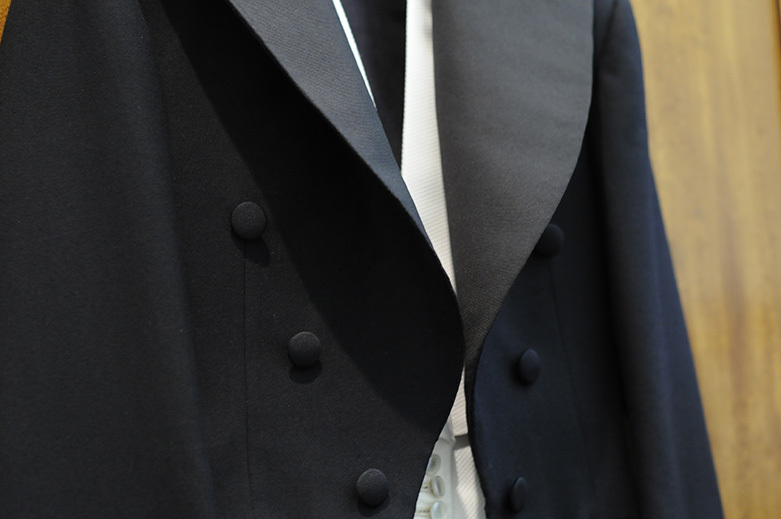 Bespoke One Button SB Suit Jacket made of Drapers Flannel. 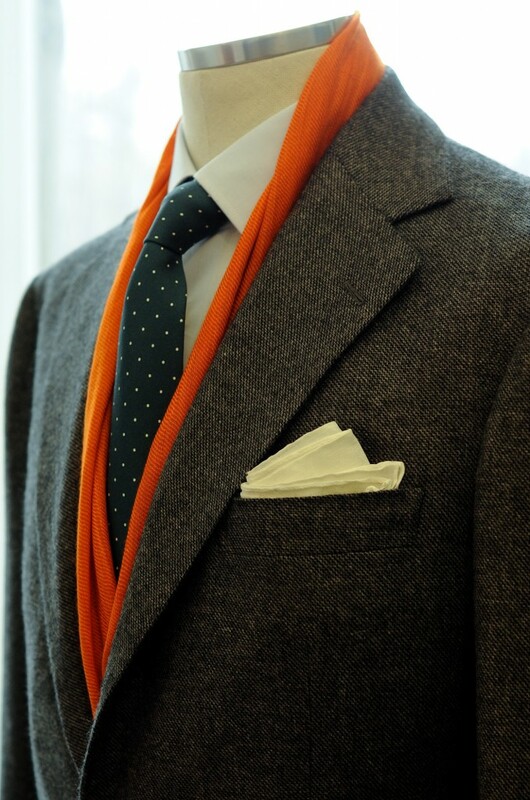 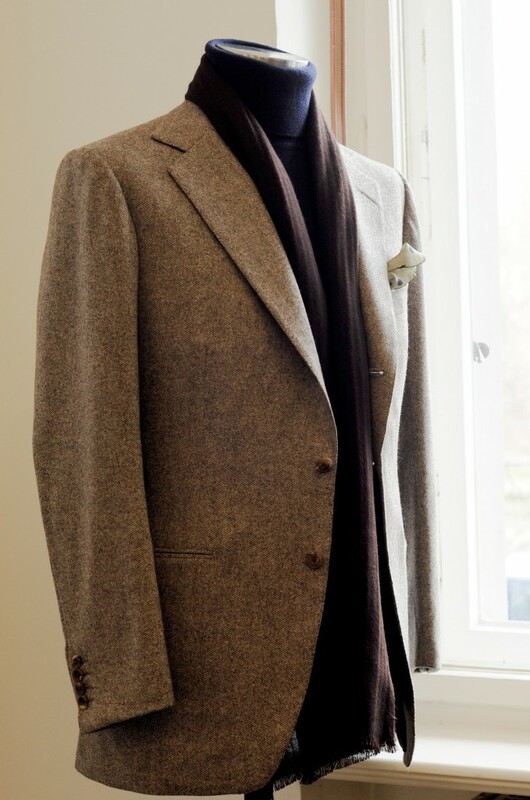 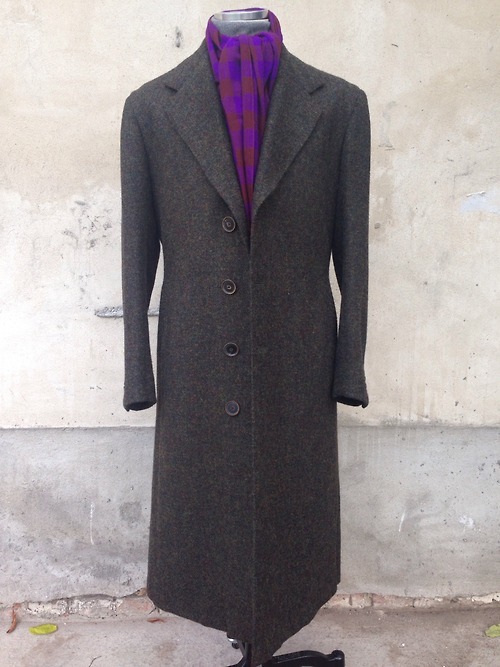 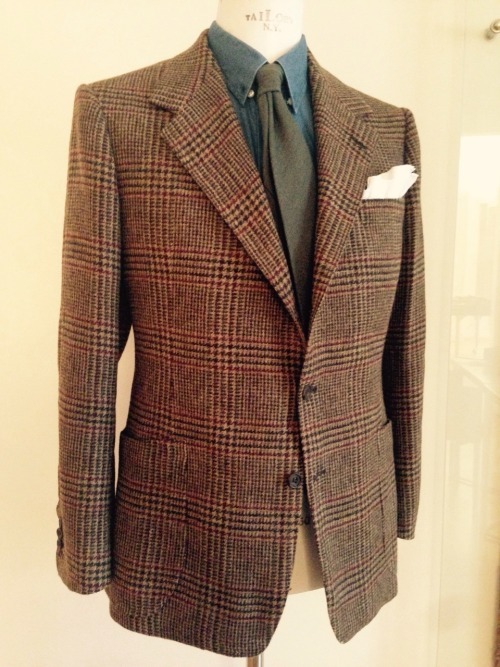 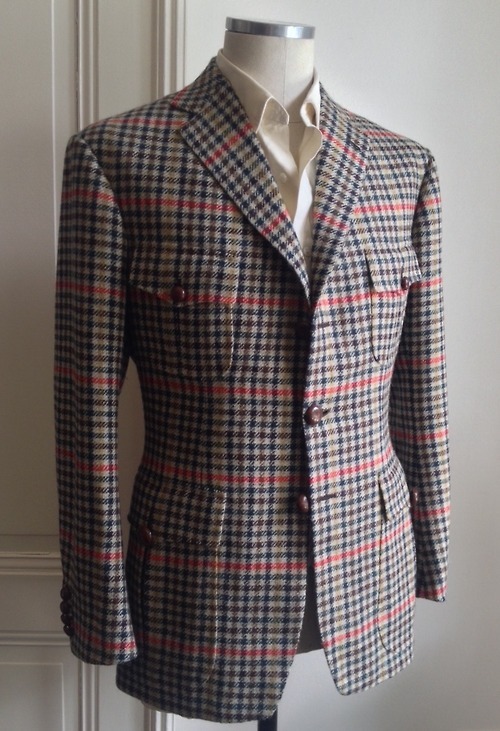 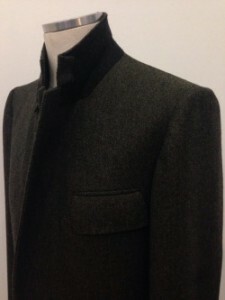 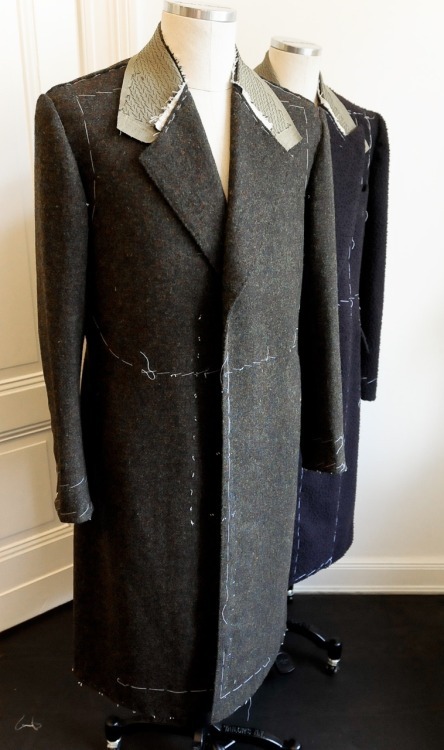 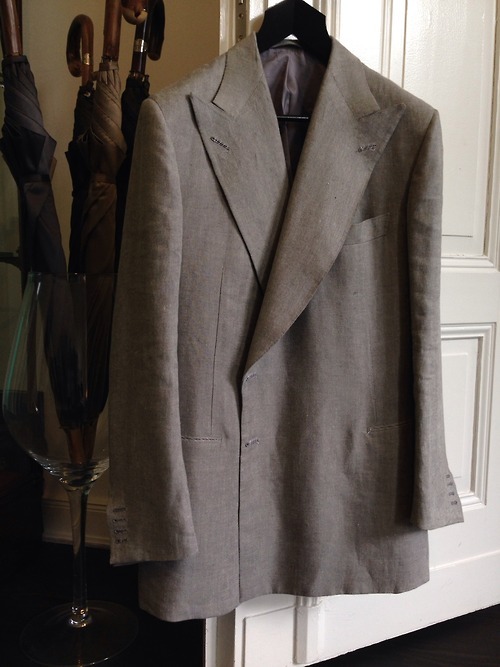 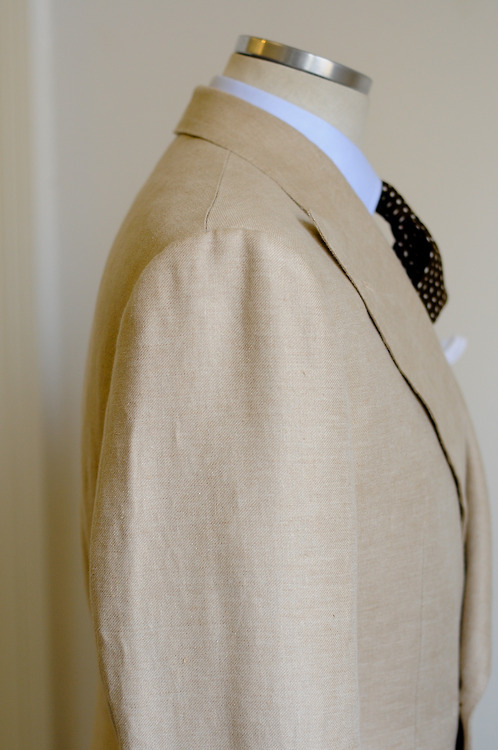 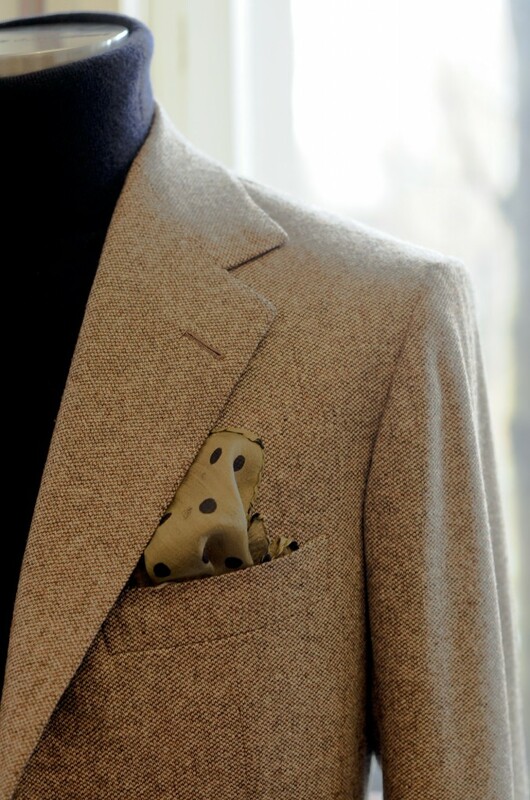 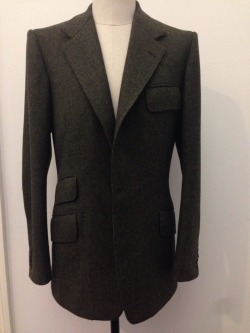 Bespoke Sports Jacket, fabric: W.Bill Overcoating Tweed. 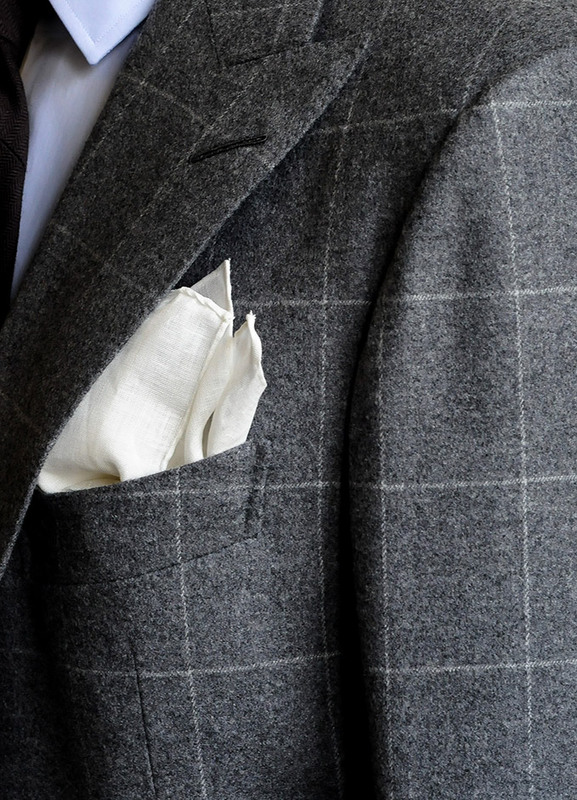 Oversized slanted Flap Pockets. 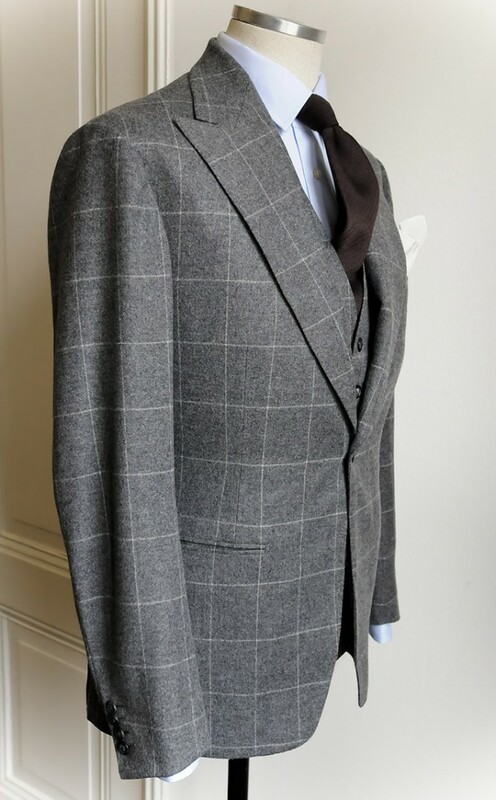 Three piece mid grey window pane flannel. 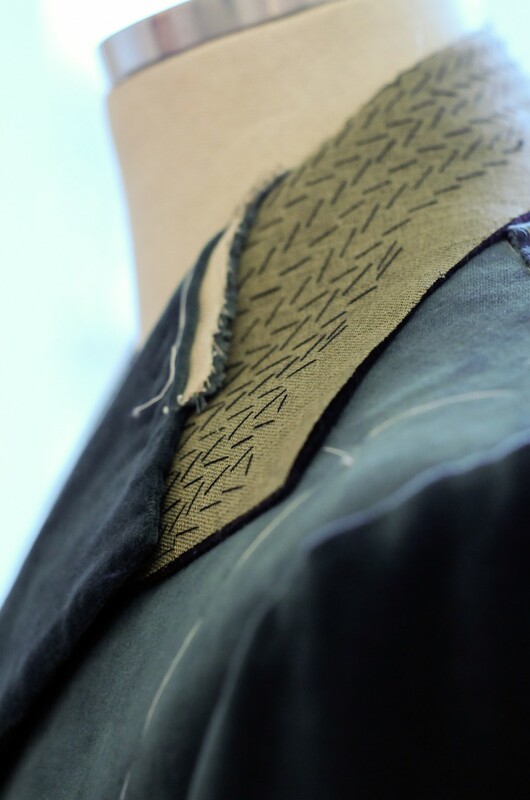 Slip stiched to the tape. 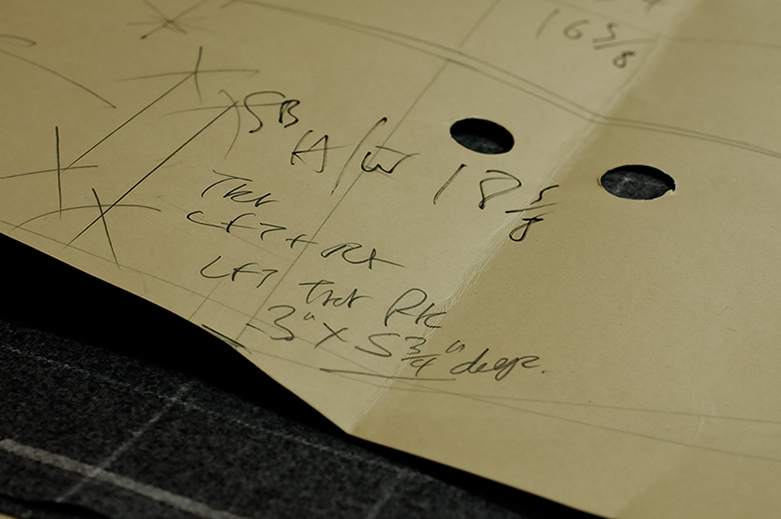 Facing lain on and based in position. 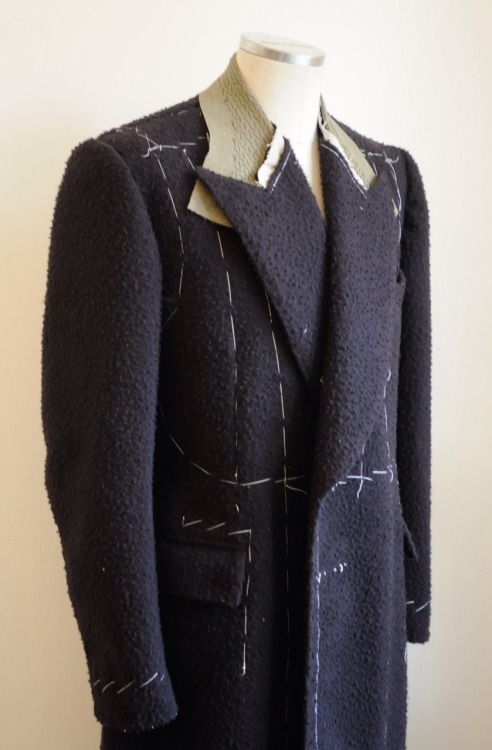 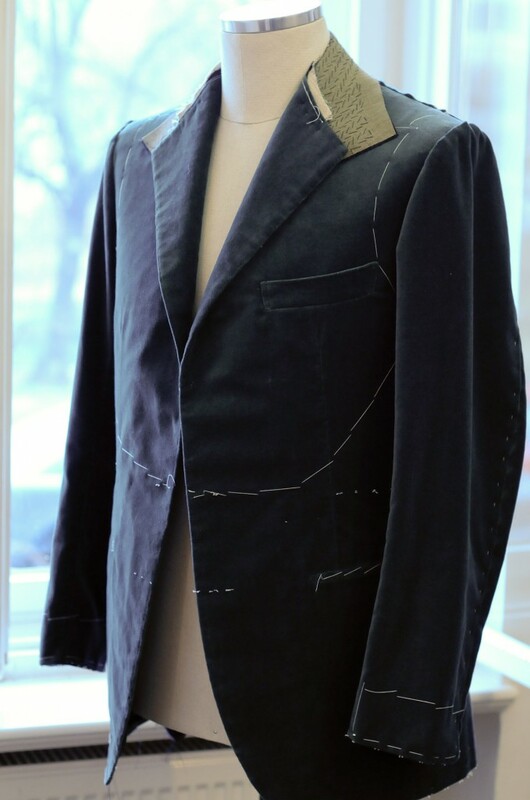 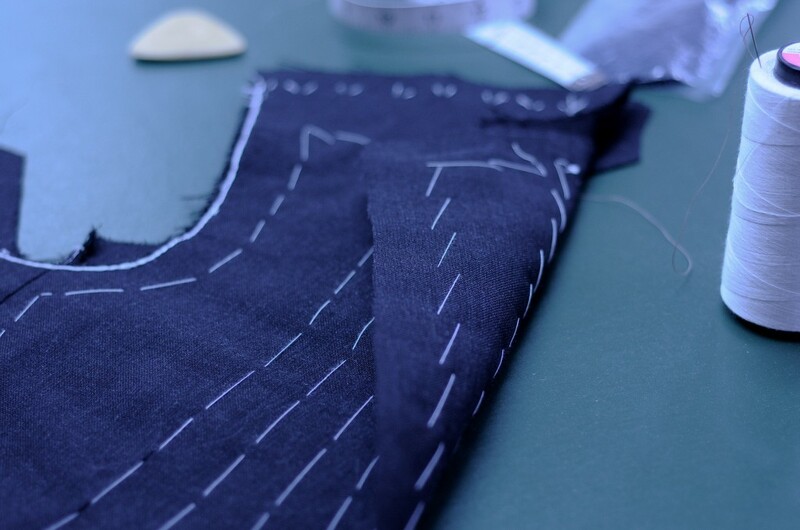 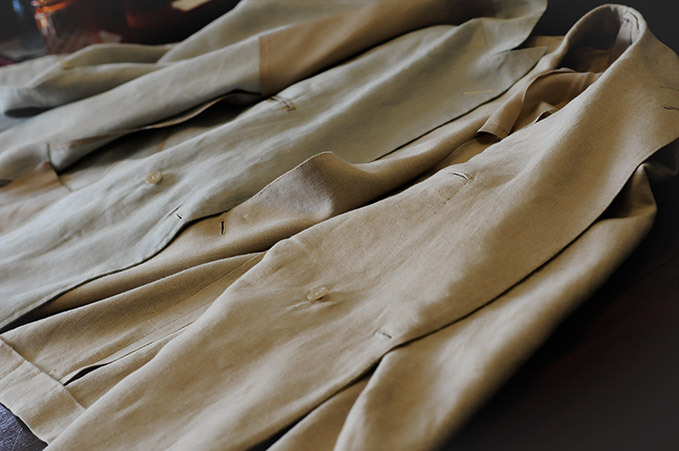 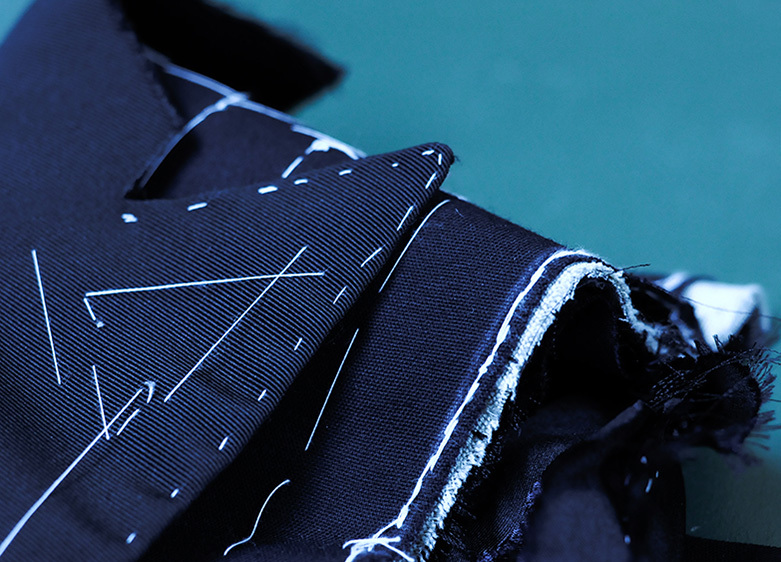 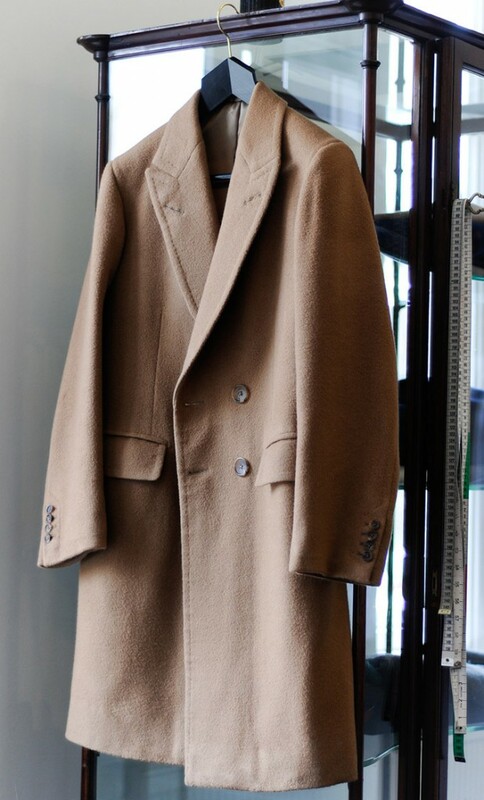 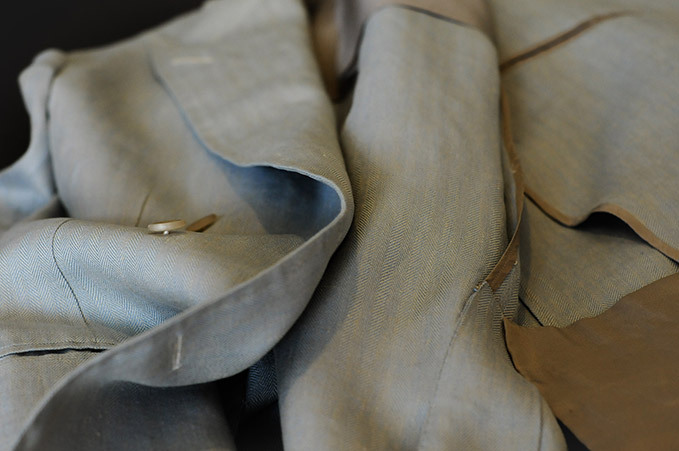 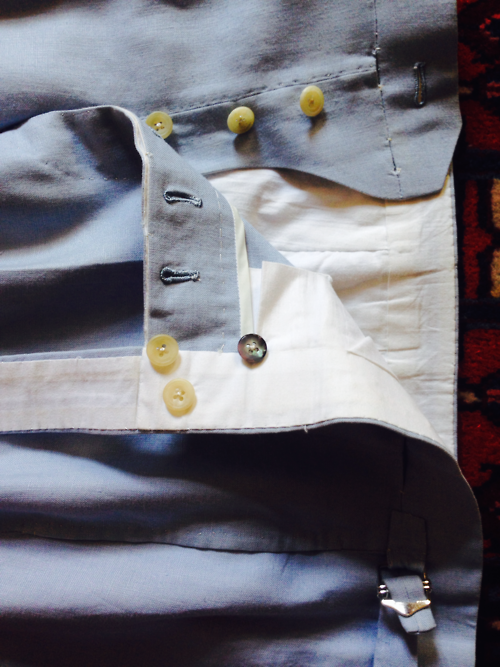 Facing seam allowance is turned back and slip stiched to the jacket. 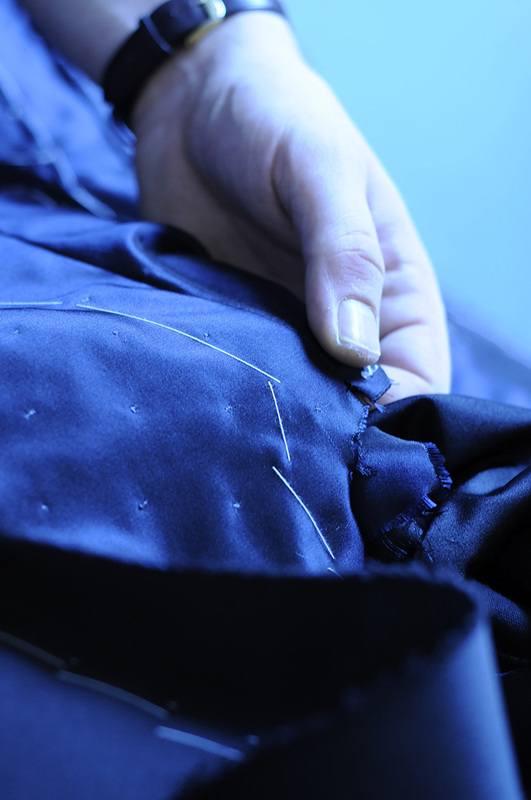 Finished lapel has being pick stiched and pressed. 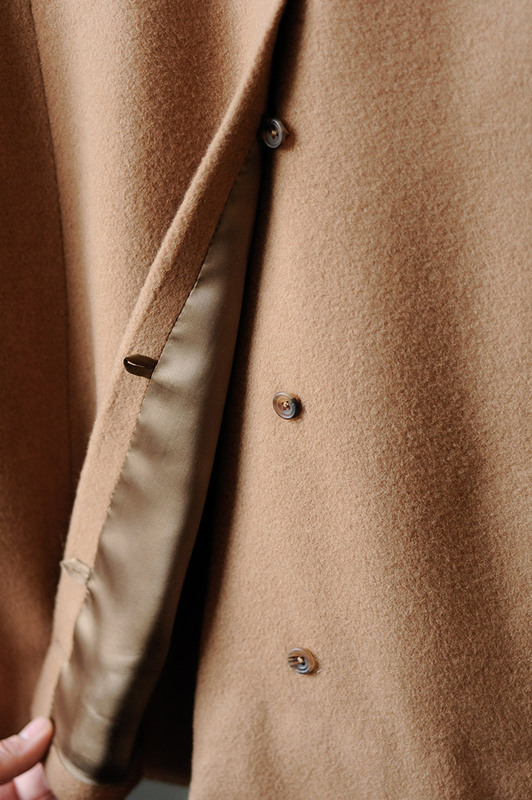 Holland & Sherry Cash, Fawn Barleycorn. 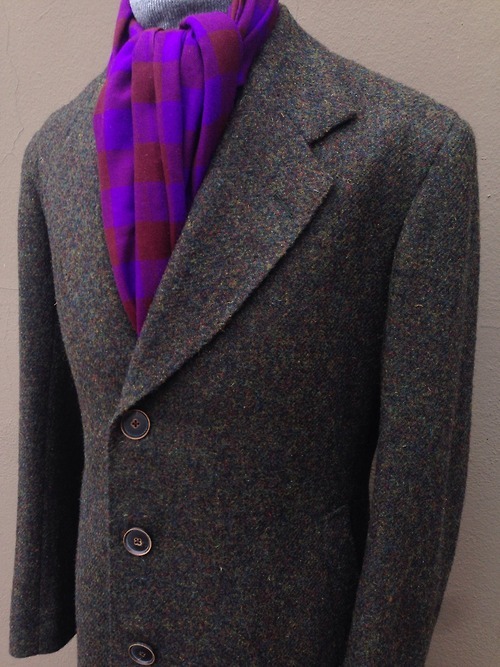 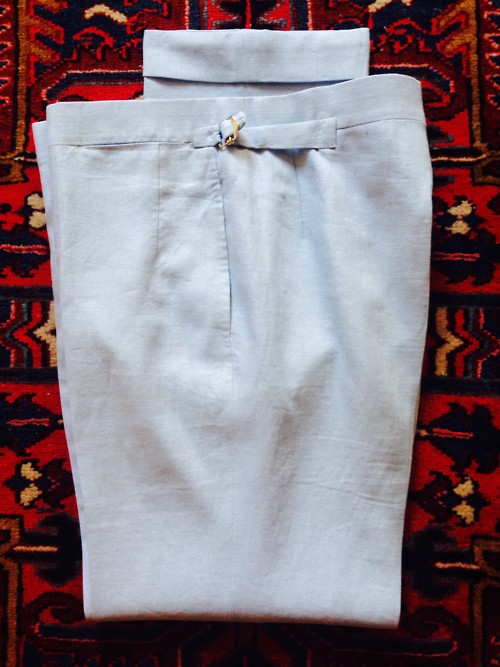 Harrinson’s Moonbeam, Mid Grey Lambswool. 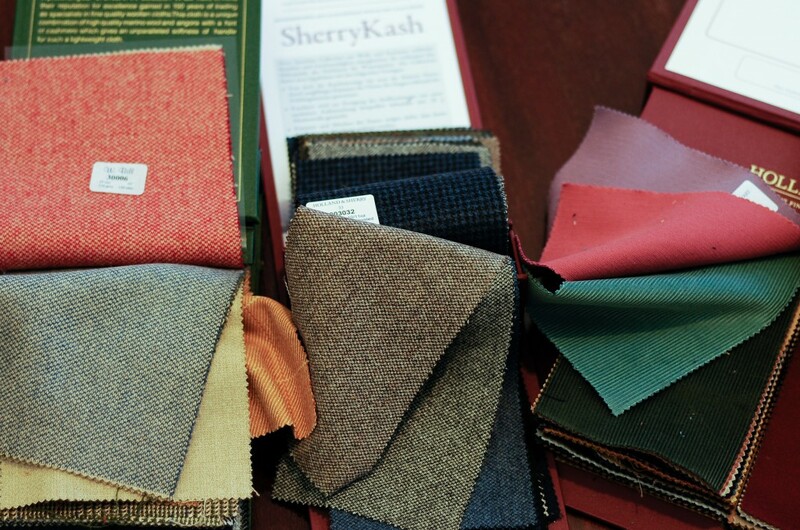 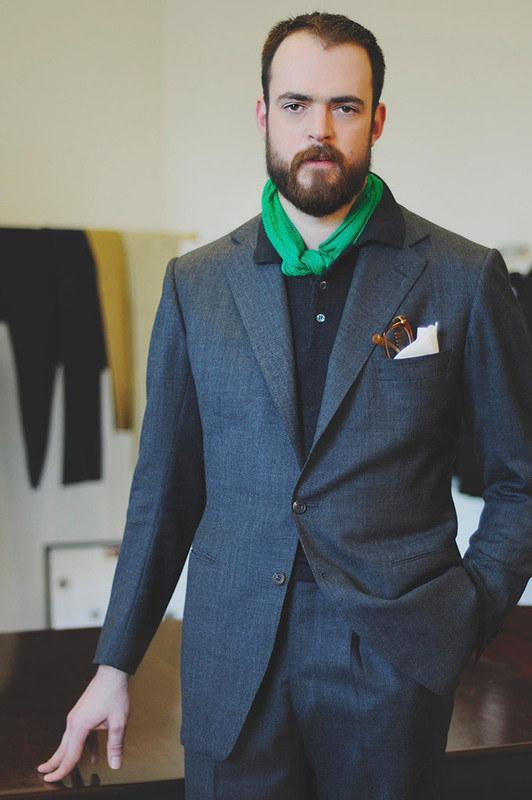 Sping is almost there so here are some nice cloth to match to that: Moleskins and Corduroys, Sherry’s light and soft Wool & Cashmere and incredible W. Bill’s „Lamlana“. 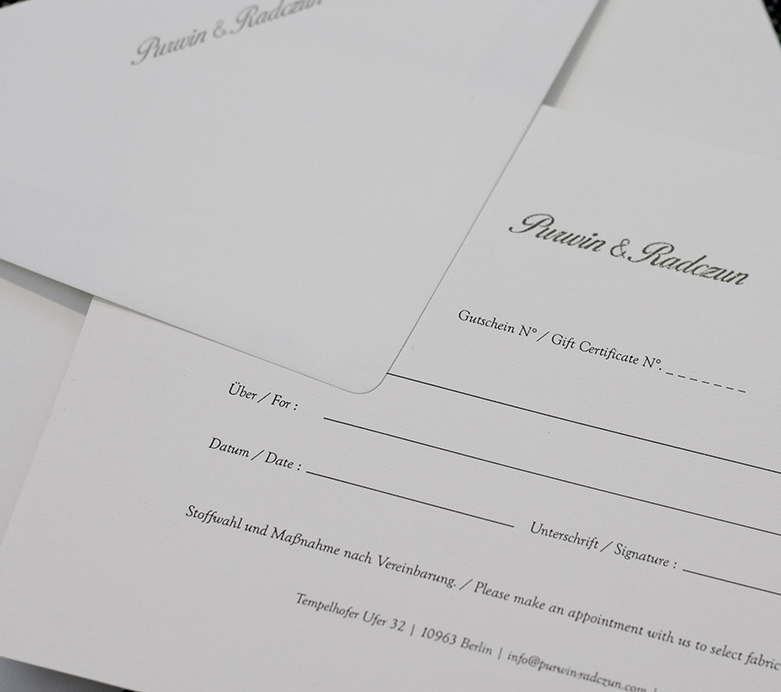 Available from our studio, Purwin & Radczun gift vouchers. 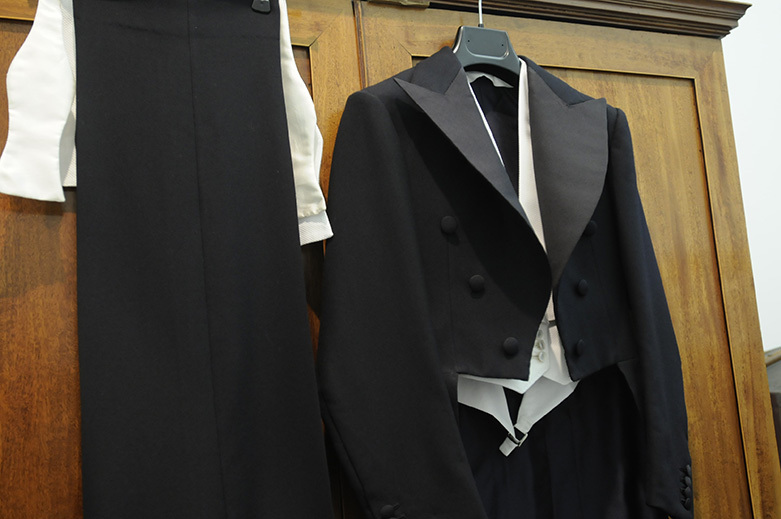 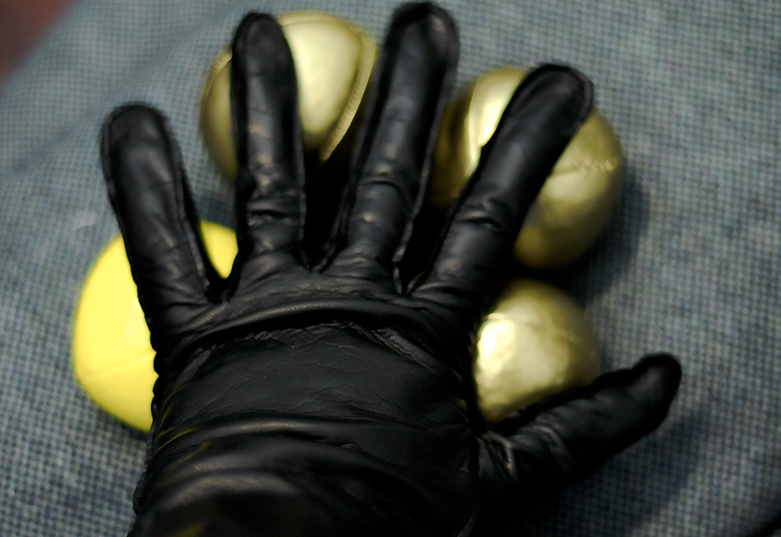 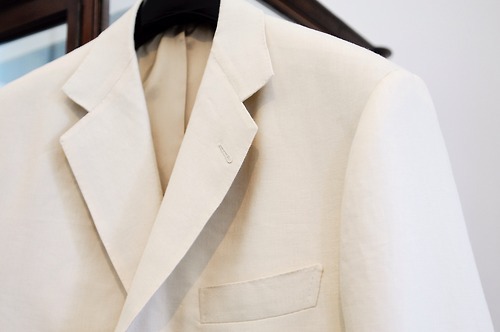 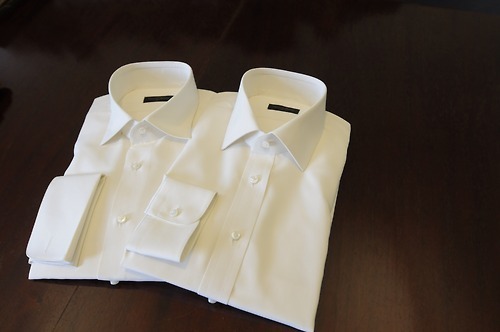 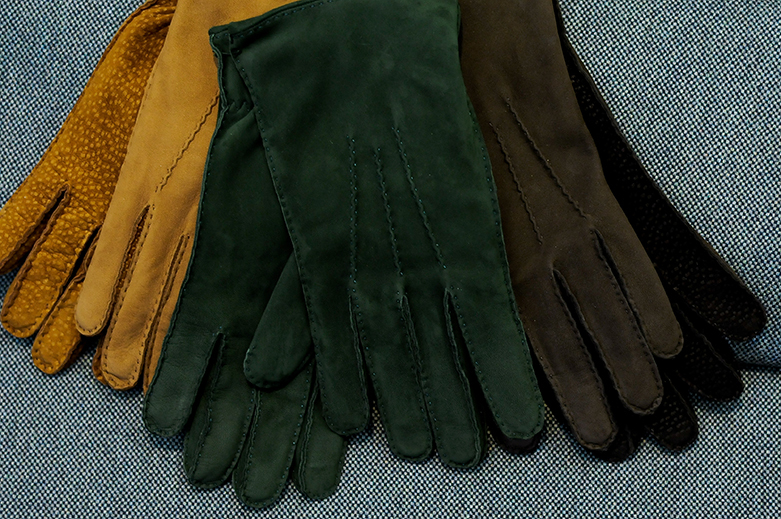 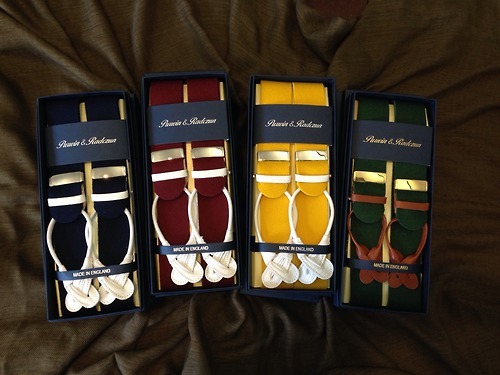 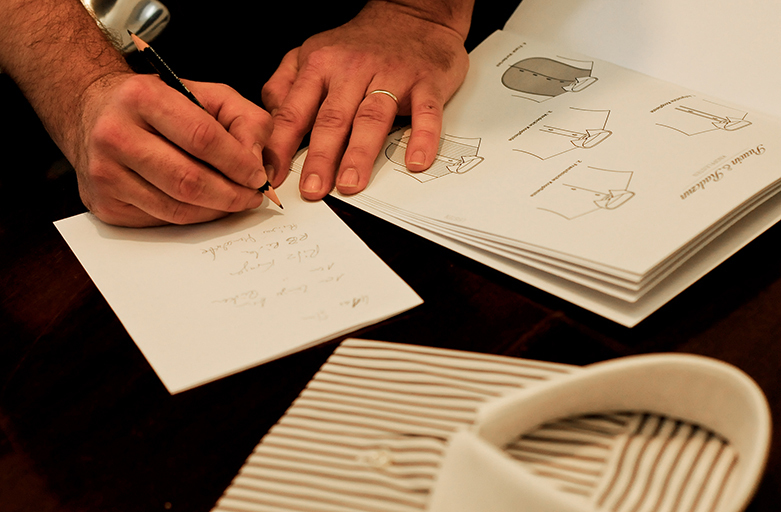 Picking all options, such as collar, cuffs, fronts, backs or monogram. 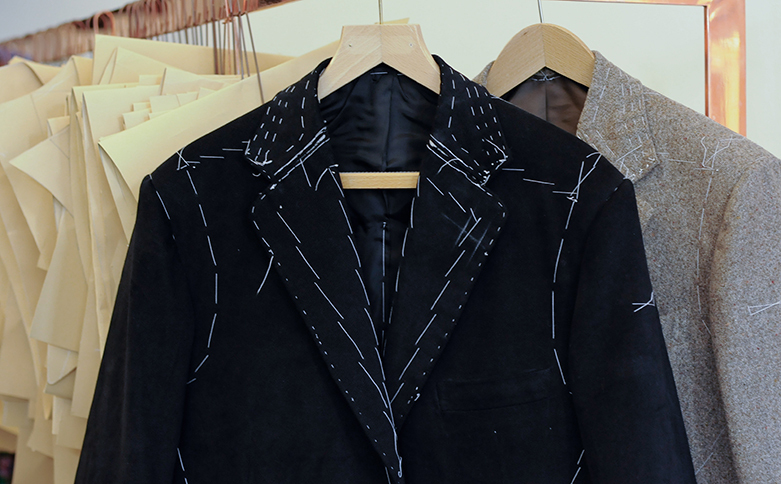 Two Jackets ready for the finisher. 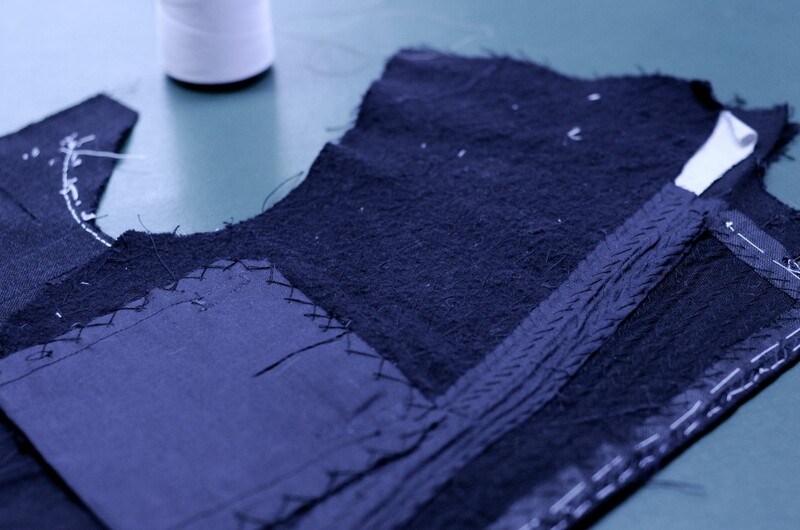 Black cotton drill & oatmeal thornproof. 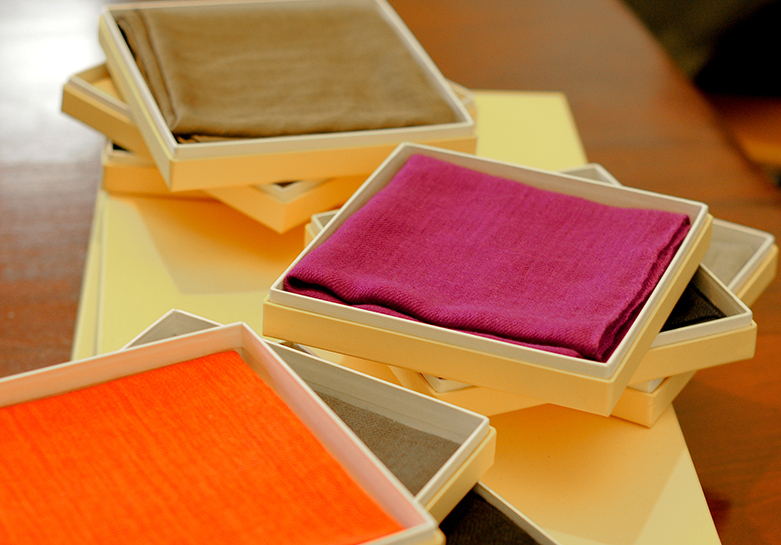 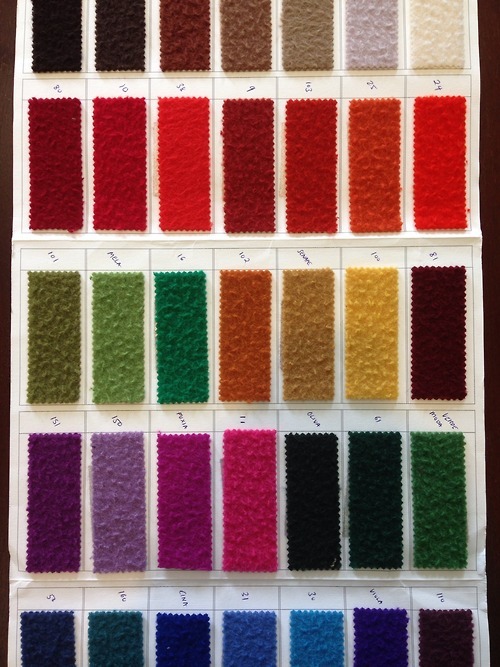 Beautiful & colorful cashmere scarves arrived from our beloved neighbors. 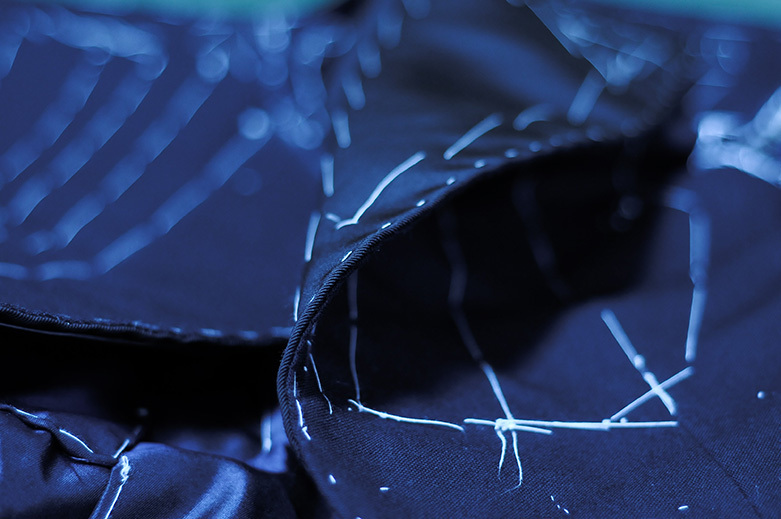 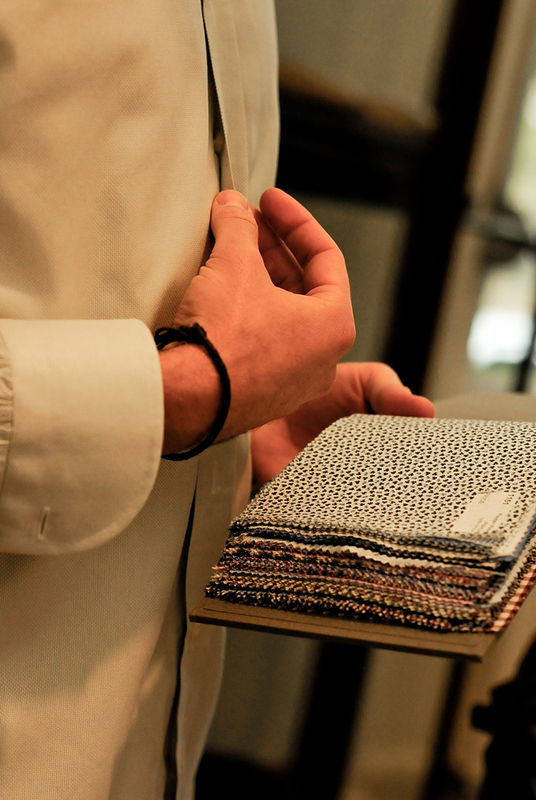 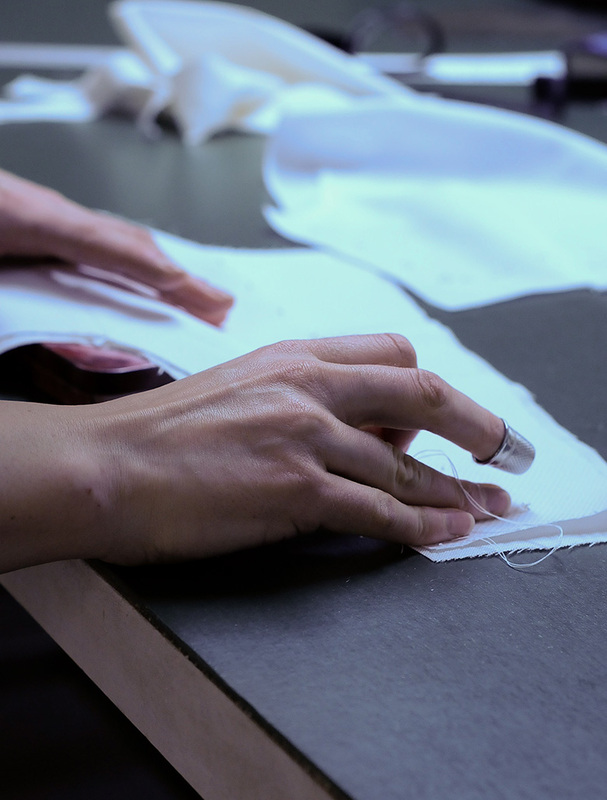 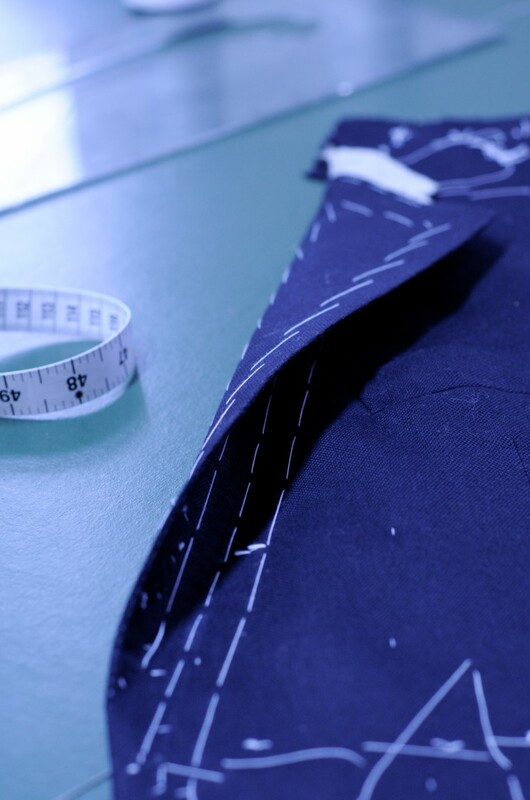 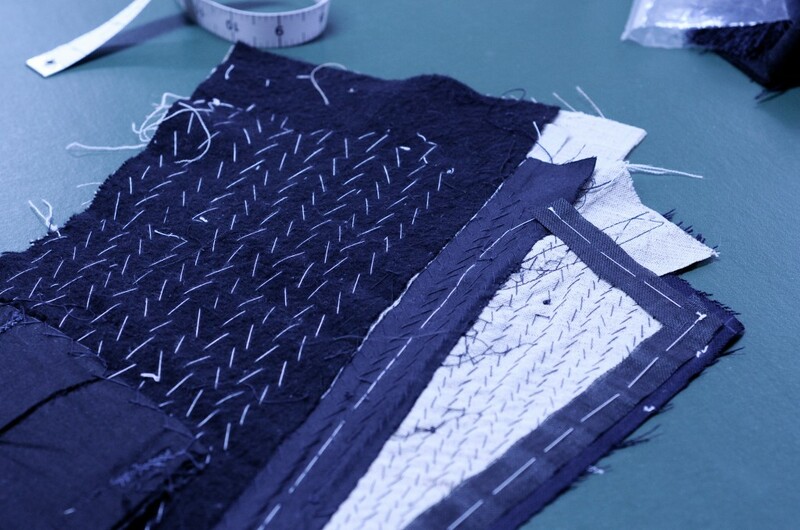 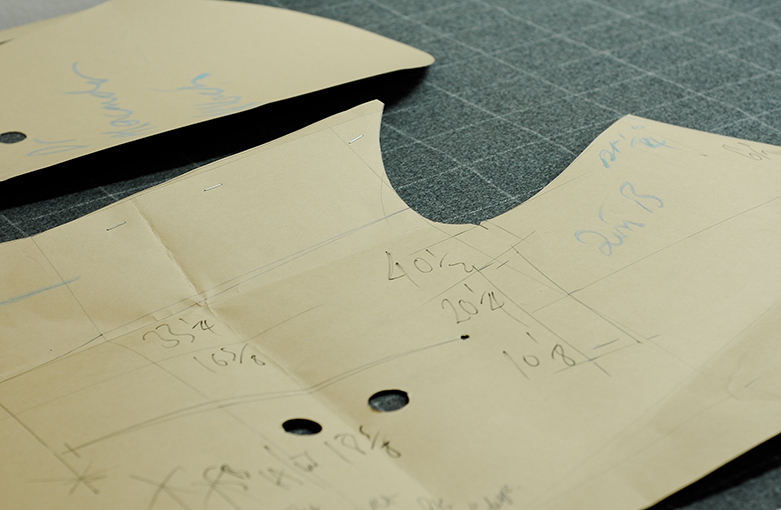 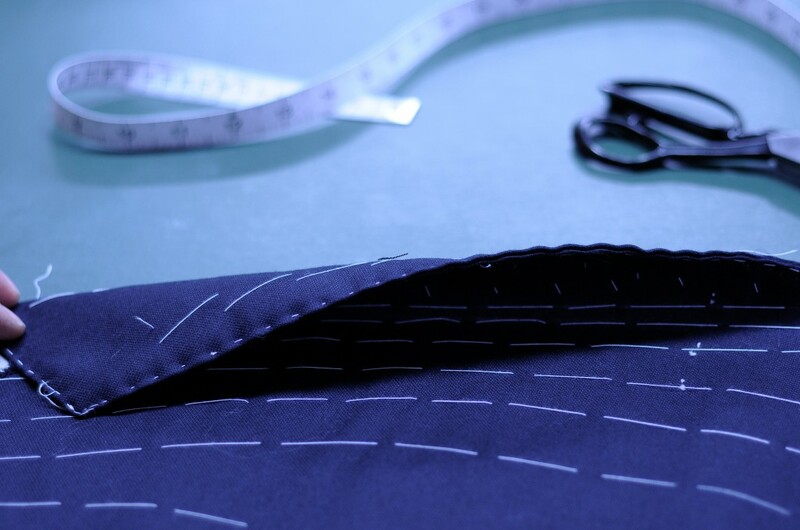 A unique pattern is cut for each individual customer. 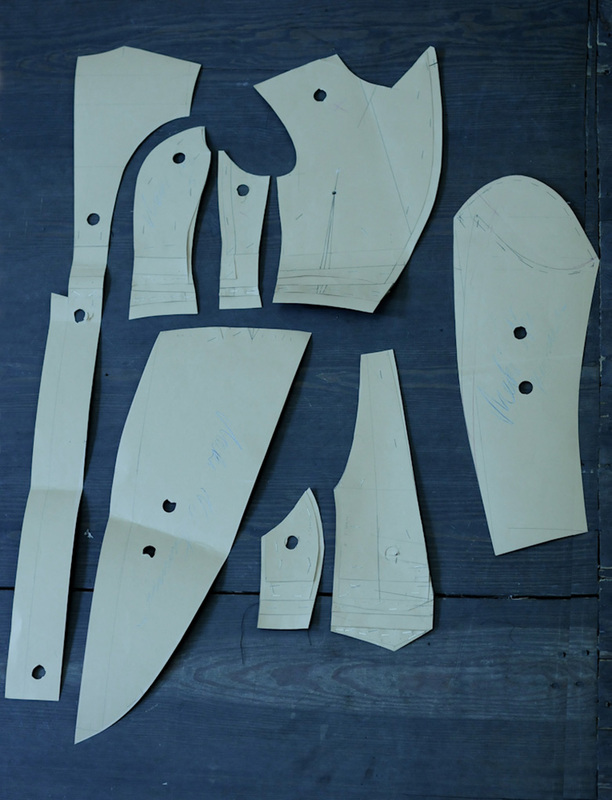 We require three fittings for all new customers. 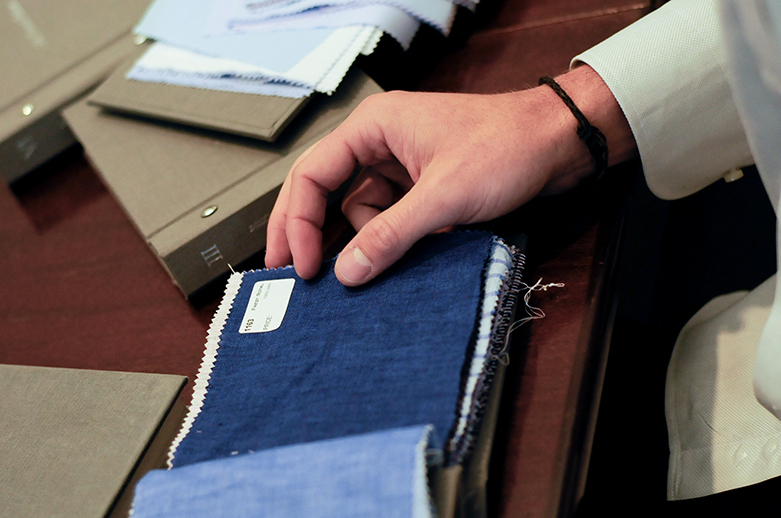 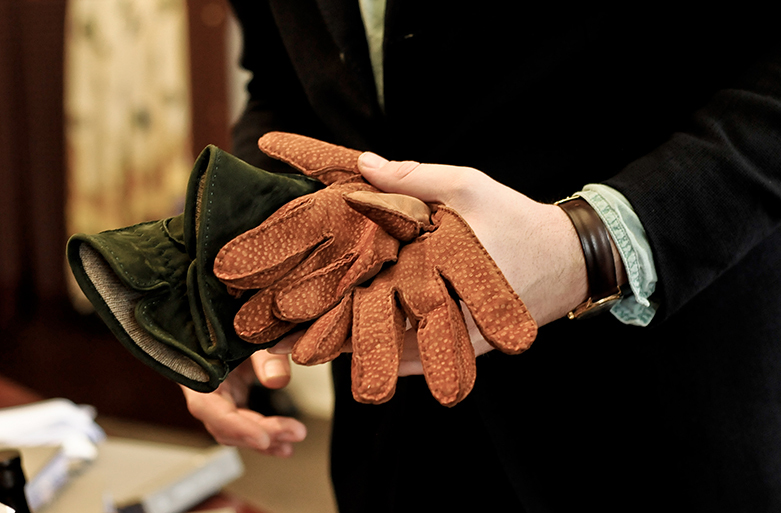 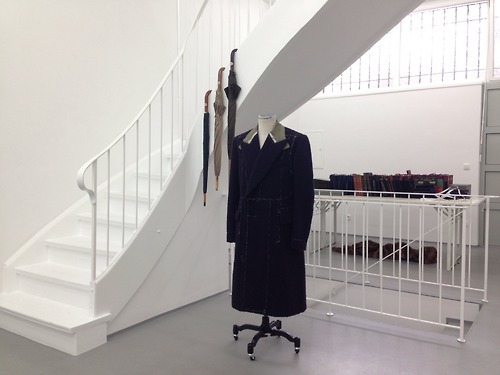 To learn more about our bespoke service please feel free to contact us.